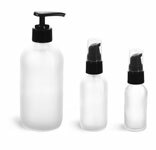 In a low profile style, choose opaque white PET heavy wall jars in three convenient sizes to package medicinal, cosmetic, and spa products. White PET heavy wall plastic jars are durable with a thicker wall and base construction, providing high impact resistance, as well as excellent barriers for extended storage. These bulk plastic jars do not include closures. Simply use the cap codes and addon options below to find an assortment of compatible caps.